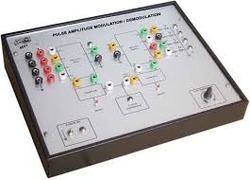 Our range of products include tdm mux / demux trainer model, pulse amplitude ( pam ) mod / demod trainer, pulse position ( ppm ) mod / demod trainer, adeptive delta demodulation, adeptive delta modulation and adeptive delta modulation & demodulation trainer. 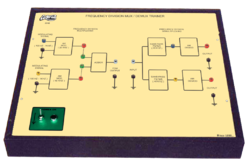 Since the inception of our company, we have been able to manufacture and supply the optimum quality of TDM Mux / Demux Trainer Model. Designed as per the industry laid norms, the offered model is known for its rich features such as compact design and optimum functionality. 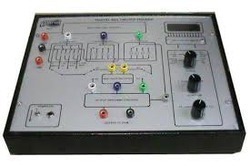 Besides this, the offered trainer model is available with us at cost effective prices. Observation of the output in the CRO. Receiving or demultiplexing of several separate information channels in the same communication circuit simultaneously and without interference. 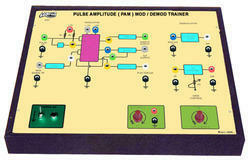 * Demonstrates the principle and working of a Pulse Amplitude ( PAM ) Mod / Demod Trainer. * Built – in IC based modulating circuit. * Modulating signal and carrier signal to be provided externally for which connecting facility provided on board. * Observation of pulse amplitude modulated waveform. * Demodulation achieved using diode detector. * Observation of demodulated waveform. * Built – in amplifier to increase detection efficiency. * Pulse amplitude modulated signal to be provided externally for which connecting facility provided on board. 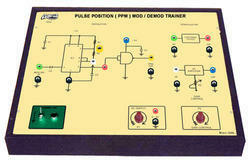 * Demonstrates the principle and working of a Pulse Position ( PPM ) Mod / Demod Trainer. * Built in IC based modulating circuit. * Observation of pulse position modulated waveforms. * Built – in pulse position demodulation circuit. * Observation of demodulated waveform on CRO. * Pulse position modulated signal to be provided externally for which connecting facility provided on board. * Demonstrates the principle of Adeptive Delta Demodulation. 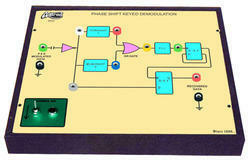 * Built – in Adaptive Delta Demodulation circuit using a Low Pass Filter and an Integrator. 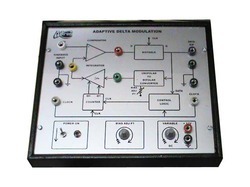 * Adaptive Delta modulated signal to be provided externally for which connecting facility provided on board. * Facility for connecting external modulating signal. * Demonstrates the principle and working of Adeptive Delta Modulation. * IC based modulating circuit. * Modulating circuit consists of amplifier, variable sampling rate generator, Multiplexer, an Averaging Circuit, Integrator and Comparator. * Observation of modulated signal on CRO. 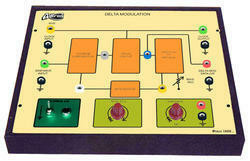 * Demonstrates the principle and working of Adeptive Delta Modulation / Demodulation Trainer. 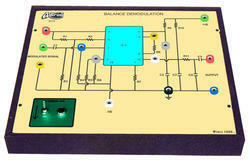 * Demonstrates the principle of Balanced ( DSB ) Modulation / Demodulation Trainer. 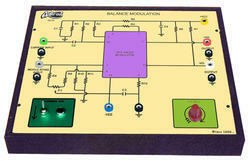 * IC based balance modulator. * Verification of suppression of carrier and fine adjustment for optimum carrier suppression. * Demonstrates the effect of the input audio level on double side band output amplitude. * Built – in Balanced ( DSB ) Demodulation circuit using IC1496. * Balanced ( DSB ) modulated signal to be provided externally for which connecting facility provided on board. * Demonstrates the principle of Balanced ( DSB ) Demodulation. * Facility to connect carrier signal from modulator. * Demonstrates the principle of Balanced ( Double Side Band ) Modulation. * Demonstrates the principle of Delta Demodulation. 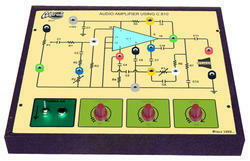 * Built – in Delta Demodulation circuit using a Low Pass Filter and an Integrator. 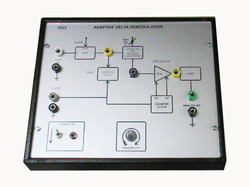 * Delta modulated signal to be provided externally for which connecting facility provided on board. * Demonstrates the principle of Delta Modulation. 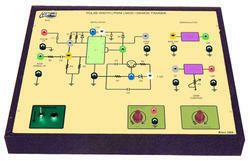 * Modulating circuit consists of amplifier, variable sampling rate generator, Multiplexer, Integrator and Comparator. 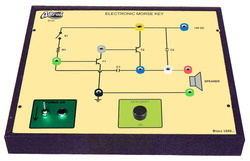 * Demonstrates the principle and working of an Electronic Morse Key. * Audio and Visual indication provided. * Bounceless key for training of morse language. * Demonstrates the principle and working of a Fibre Optics Demonstrator ( Single Channel ). * The system consists of a Fibre Optic Transmitter, Fibre Optic Receiver, Fibre Optic Cable with fitting accessories. * The Fibre Optic Transmitter has a single input channel for both analog signal and digital signal. 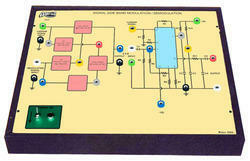 An electrical to light modulation signal converter with photo transducer for transmission is provided. * The Fibre Optic Receiver consists of an optical transducer, which converts back the light modulated signal into electrical signal and then demodulates the same to provide the output. * The fibre optic cable with fitting accessories at both the transmitter/receiver ends is provided. 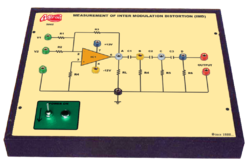 * Frequency Division Mutiplexing Circuit. * Frequency Division Demutiplexing Circuit. 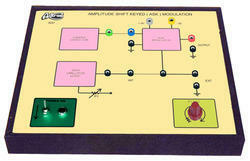 * Demonstrates the principle and working of a Frequency Shift Keyed ( FSK ) Mod / Demod Trainer. 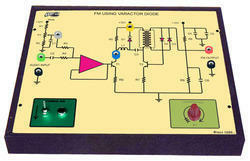 * IC based modulating circuit using Voltage Controlled Oscillator ( VCO ). * Modulating Signal ( 1,0 ) to be provided externally for which connecting facility provided on board. * Demodulation achieved by using Phase Lock Loop ( PLL ) and Low Pass Filter ( LPF ). * FSK Modulated Signal to be provided externally for which connecting facility provided on board. 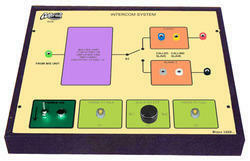 * Demonstrates the principle and working of an Intercom System Demonstrator. * The system consists of 4 units, viz, A master unit and 3 slave units. * Facility for “TALK” and “LISTEN” on all units. * Master unit with facility for connecting with any slave unit with indication. 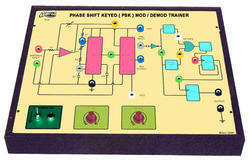 * Demonstrates the principle and working of a Phase Shift Keyed ( PSK ) Mod / Demod Trainer. 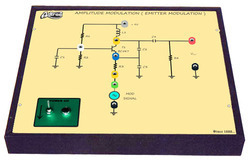 * Modulating Circuit consists of a Phase Shifter Amplifier and Multiplexer. * Observation of phase shift keyed modulated waveform. 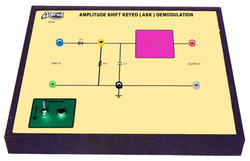 * Built – in Phase Shift Keyed Demodulation circuit. 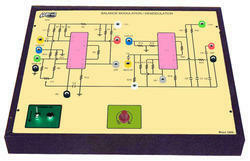 * The demodulated circuit is made using a Biphase Splitter, Phase Lock Loop ( PLL ) and a delayed Flip Flop. 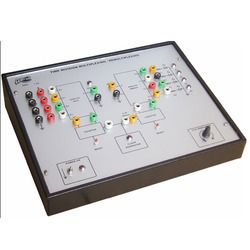 * Phase Shift Keyed Modulated signal to be provided externally for which connecting facility provided on board. * Demonstrates the principle and working of a Phase Shift Keyed Demodulation. 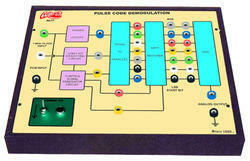 * Demonstrates the principle and working of a Pulse Code ( PCM ) Mod / Demod Trainer. * Modulating circuit consists of a Positive Clamper, Sample and Hold ( S & H ), Analog to Digital Converter ( ADC ), Parallel to Serial Converter and Control Signal Generator. * Facility for connecting external AC or DC Modulating Signal. * Observation of binary coded analog information by the LED status. * Built – in pulse code demodulation circuit. * The demodulated circuit is made using a Serial to Parallel Converter, Parallel Shift Register, DAC, Low Pass Filter for both AC & DC. * Pulse code modulated signal to be provided externally for which connecting facility provided on board. 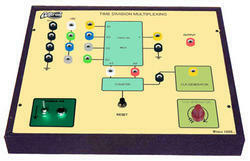 * 1 MHz clock to be provided from the Pulse Code Modulator unit. * Demonstrates the principle of Pulse Code Demodulation. * The demodulated circuit is made using a Serial to Parallel Converter, Parallel Shift Register, DAC, Low Pass Filter for both AC and DC. * Demonstrates the principle and working of a Pulse Width ( PWM ) Mod / Demod Trainer. * Observation of pulse width modulated waveform. * Built – in pulse width demodulation circuit. * Pulse width modulated signal to be provided externally for which connecting facility provided on board. 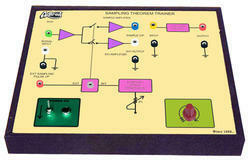 * Demonstrates the principle and practical working of Sampling Theorem Trainer. 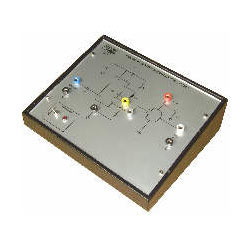 * Modulating circuit consists of a Two Channel Time Division Multiplexer, Variable Sampling Rate Generator, Sample and Hold Circuit and Time Division Demultiplexer to receive back the two Channels. * Facility for connecting externally two analog signals. * Observation of sampled Signal on CRO. * Observation of variation in sampling frequency on the sampled signal. 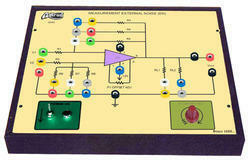 * Demonstrates the principle and working of a Single Side Band ( SSB ) Mod / Demod Trainer. 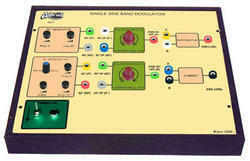 * IC based single side band modulator. * Carrier and Modulating Signals to be provided by the user. 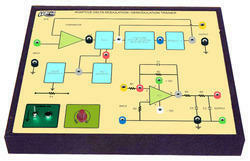 * Built – in IC based Single Side Band Demodulation circuit. * Modulated Single side band signal to be provided externally for which connecting facility is provided on board. * Demonstrates the principle and working of a Single Side Band Modulation. * Demonstrates the principle of Time Division Demultiplexer. * Receiving or de – multiplexing of several separate information channels in the same communication circuit simultaneously and without interference. * Study of 4 channel time division de – multiplexing. 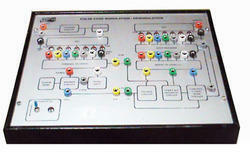 * Analog / digital signals can be obtained at any of the 4 channels. * Demonstrates the principle of MODEM Demonstrator. 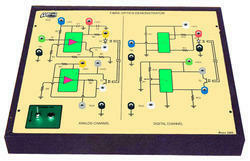 * The MODEM Demonstrator includes, FSK Generator, Amplifier, FSK Receiver, Filter, Decoder and Logic Circuit. * 5V for 1 Level. * 0V / – 5V for 0 Level. * 1700 Hz for 1 Level. * 1000 Hz for 0 Level. * The MODEM Demonstrates in Half Duplex Mode. Demonstrates the principle of Pulse Position Modulation. Built in IC based modulating circuit. 4 Modulating signal and carrier signal to be provided externally for which connecting facility provided on board. Observation of pulse position modulated waveforms.